The Oracle is looking for examples of what people have been doing to combat bullying and to build healthy community life. We have suggested that a road to prevent bullying sees landlord, management, and tenants working together to create a polity, a form of governance with accepted norms and rules that are enforced, and with a means to resolve disputes. Everyone shares responsibility and no person—housing provider/landlord, manager, staff, resident, visitor either bullies or is bullied. We are glad to learn of any positive effort to train and educate about bullying and to create a shared sense of appropriate behavior. Here is the example of creating a "Code of Conduct" developed at a senior affordable housing community, "The Turtles" in Beverly, Massachusetts. We are grateful to Ms Stewart for sharing this story. The idea of creating a “Code of Conduct” for Turtle Creek/Turtle Woods (Senior Affordable Housing) was inspired by a Bullying Presentation here at “The Turtles,” led by Robin Krawczyk , LICSW of Jewish Family & Childrens Services (JF&CS). 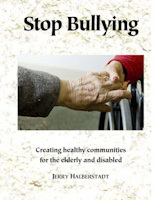 [Krawczyk presents examples of bullying and offers a variety of constructive ways for staff, bystanders, and victims to respond.] In addition to her wonderfully beneficial presentation, she left us with “food for thought” along with some sample codes of conduct to use if we chose to develop our own. We asked for residents to sign up if they would be interested and able to participate in a short term focused task group. The response was favorable. Once we had our volunteers from each building, we began our work with a group of residents from each building. One of out initial goals was to keep the groups small enough so everyone would have the chance to be heard. Communication to the community and management went out via e-mails and newsletters. The residents held three meetings. Property Management and Resident Service Coordinators sat in on the first meeting in a supportive role to oversee the process, and generally answer questions. A lower management profile was kept for the second meeting which actually went quite well. Residents seemed to have given a great deal of thought to what had been discussed, and came back ready to work. The third meeting was somewhat of a disaster, as the task for that joint meeting was to have the two groups sit together to merge the two drafts into one. Unfortunately, no one could agree on how to do that, so the task was basically tabled. After a few weeks of inertia, I stepped up to the plate to merge the two drafts, while attempting to preserve “the flavor” of both groups' efforts. The final draft was informally circulated a bit, before being sent on to management. Once approved, a sigh of relief and sense of accomplishment was undoubtedly felt by all who had participated. Mission accomplished! There has only been positive resident feedback since delivery. Going forward, The TC/TW “Code of Conduct” will be included in all new resident packets. We are hopeful that all of our residents will become active advocates for our “Golden Rules”. On the reverse side you will find the long awaited “Code of Conduct” that has gone through multiple forms of revisions since its inception. Thank you to the small committee of residents who signed up to be a part of crafting a code that would be inclusive of the values this community wishes to uphold. Please take time to read it, reflect on it, and in the spirit in which it was created, allow it to serve as a touch stone/reminder in all of our daily interactions. We as residents, recognize that belonging to a community has many advantages, and also comes with responsibilities regarding how we behave in our shared spaces. We strive to be a welcoming and caring community by treating our neighbors the way we would want to be treated. Having mutual respect for one another and care for our surroundings. Upholding a zero tolerance policy for bullying/or harassment of any kind; teasing, profanity, or negative gossip toward any individual or groups of residents in the community. We embrace diversity and abhor discrimination against anyone, for any reason. We strive for respectful communication with other members of the community, including both fellow residents & staff. Everyone who resides here, regardless of race, color, national origin, gender, gender identity, sexual orientation, disability, ancestry, genetic information, marital status, religious affiliation, veteran or active military status, age, familial status, and source of income has the right to live here and to the peaceful enjoyment of their apartment and building. TC/TW HOUSE RULES establish acceptable conduct for common areas and must be adhered to. No resident, guest, or group can exclude or discourage another resident from group activities, nor dominate, interrogate, or dictate the rights of others. The Oracle asks for your ideas and experiences. What do you think of the code in this example? What do you think of the process that was followed? Have you been involved in trying something like this? How would you know if it worked?